A group which aims to promote the horticulture and floriculture of the environment local to esbs has benefited from its continued support for their work. 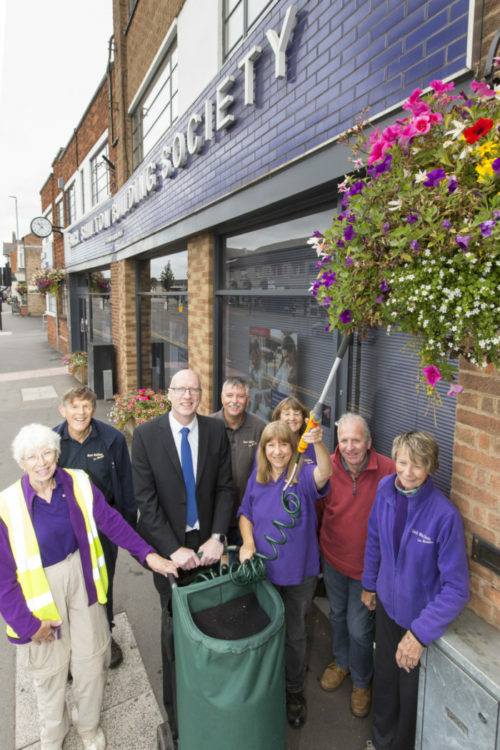 Earl Shilton in Bloom has once again received a donation from the Society, which has its Head Office in the Leicestershire town. Launched in 2014, Earl Shilton in Bloom is comprised of approximately 20 volunteers who work to preserve local natural habitats via the provision of floral displays and landscaped places for the benefit of the public, while developing relationships with other groups within the community and attracting more visitors to the area. The group holds a meeting on the second Monday of each month at Earl Shilton Constitutional Club, where they draw up their plans and discuss upcoming projects. Every Tuesday morning, the volunteers also gather to maintain the town’s plant life, while on alternate Sundays, they take on more significant tasks. war memorial, and a mural depicting a sunrise over a field of poppies, which is located in the centre of the town. Chris Tilley, Secretary of Earl Shilton in Bloom, said: “The continued support from esbs means a great deal to our members. “It’s good to know that local businesses are behind us and appreciate what we are doing in the town. Richard Carson, Business Development and Marketing Manager of esbs, said: “We are very happy to be providing our support to Earl Shilton in Bloom once again. “The work that the group is involved in is essential to the preservation of the local environment and the volunteers deserve to be recognised for their dedication to the project.